1985 Catalina 25 in good condition; 9.9 hp Suzuki 4-stroke, electric start motor in excellent condition, recently serviced; new ground tackle; cabin and most running lights changed to LED; no trailer; in slip at Rudd's Creek Marina, Buggs Island Lake, near Boydton, VA (aka Kerr Lake in NC). Slip renewable in pristine new small marina. Nice boat at a bargain price. 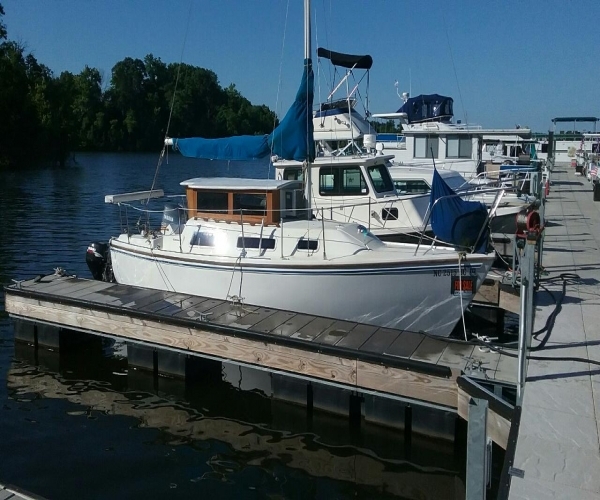 Previous owner removed original pop-up top and replaced with permanent wood superstructure which makes for greater head height in cabin; odd, but it works, as he added a bench on stern rail to sit on for vision over cabin. Not sailed for a year or so, but sails in good condition when last checked in June 2017; motor used this year, runs great.